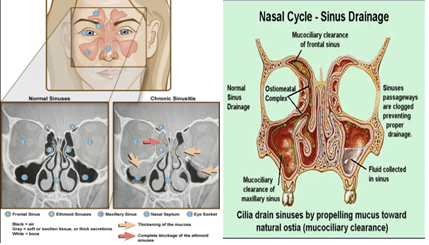 Chronic rhino sinusitis (CRS) is a group of multifactorial diseases characterized by inflammation of the mucous of the nose and para-nasal sinuses with a history of at least 12 weeks of persistent symptoms despite maximal medical therapy. The diagnosis on the basis of symptoms is common but can be unreliable. The major criteria include facial pain, nasal obstruction, hyposmia, purulence on examination, and fever. While, minor criteria include headache, fatigue, dental pain, and cough. Currently the gold standard for the diagnosis of chronic sinusitis is CT scan. Nasal polyps. These tissue growths may block the nasal passages or sinuses. Allergic reactions. Allergic triggers include fungal infection of the sinuses. Deviated nasal septum. A crooked septum the wall between the nostrils may restrict or block sinus passages. Trauma to the face. A fractured or broken facial bone may cause obstruction of the sinus passages. Other medical conditions. The complications of cystic fibrosis, gastroesophageal reflux, or HIV and other immune system-related diseases may result in nasal blockage. Respiratory tract infections. Infections in your respiratory tract most commonly, colds can inflame and thicken your sinus membranes, block mucus drainage and create conditions ripe for growth of bacteria. These infections can be viral, bacterial or fungal in nature. Allergies such as hay fever. Inflammation that occurs with allergies may block your sinuses. Immune system cells. With certain health conditions, immune cells called eosinophils can cause sinus inflammation. Rest. This will help your body fight inflammation and speed recovery. Moisturize your sinus cavities. Drape a towel over your head as you breathe in the vapor from a bowl of medium-hot water. Keep the vapor directed toward your face. Or take a hot shower, breathing in the warm, moist air. This will help ease pain and help mucus drain. Rinse out your nasal passages. Use a specially designed squeeze bottle (Sinus Rinse, others), saline canister or neti pot to rinse your nasal passages. The signs and symptoms of chronic sinusitis are similar to acute sinusitis, except they last longer and often cause more significant fatigue. Fever isn't a common sign of chronic sinusitis, as it may be with acute sinusitis. Asthma flare-ups.Chronic sinusitis can trigger an asthma attack. Meningitis.This infection causes inflammation of the membranes and fluid surrounding your brain and spinal cord. Vision problems. If infection spreads to your eye socket, it can cause reduced vision or even blindness that can be permanent. Aneurysms or blood clots. Infection can cause problems in the veins surrounding the sinuses, interfering with blood supply to your brain and putting you at risk of a stroke. Though exercise is a very important part of maintaining a healthy lifestyle, those suffering from sinusitis often experience pain and throbbing in the head and sinuses, even with moderate activities such as jogging. Therefore, walking and biking are both great exercise options, which will promote recovery by aiding in circulatory and respiratory health. Just remember that overly intense physical activity may worsen the symptoms of sinusitis by pushing an already-weakened immune system too hard. Smoking Quit! Smoking is harmful for your lungs, heart and also to people around you. STOP NOW! Rest This will help your body fight inflammation and speed recovery. Drink Fluids This will help dilute mucous secretions and promote drainage. Avoid beverages that contain caffeine or alcohol, as they can be dehydrating. Drinking alcohol can also worsen the swelling of the lining of the sinuses and nose. Moisturize your sinus cavities Drape a towel over your head as you breathe in the vapor from a bowl of medium-hot water. Keep the vapor directed toward your face. Or take a hot shower, breathing in the warm, moist air. This will help ease pain and help mucus drain. Rinse out your nasal passages Use a specially designed squeeze bottle (Sinus Rinse, others), saline canister or neti pot to rinse your nasal passages. This home remedy, called nasal lavage, can help clear your sinuses. If you make your own rinse, use water that's contaminant-free distilled, sterile, previously boiled and cooled, or filtered using a filter with an absolute pore size of 1 micron or smaller % to make up the irrigation solution. 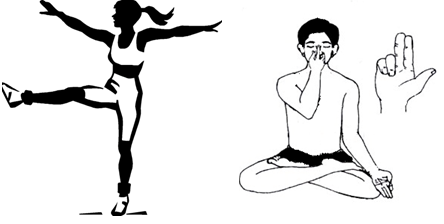 Pranayam It will reduce stress and also help you breathe better and open up your nasal passage. Head elevation Sleep with your head elevated. This will help your sinuses drain, reducing congestion. Use a humidifier If the air in your home is dry, such as it is if you have forced hot air heat, adding moisture to the air may help prevent sinusitis. Be sure the humidifier stays clean and free of mold with regular, thorough cleaning. Avoid crowds and protect against seasonal flu Avoid crowds in seasons which you tend to catch infections. Keep your surroundings clean and free from irritants and allergens. Take your flu shots as prescribed by the doctor. Eat foods rich in vitamin C, like grapefruit, oranges, and tangerines. Studies that have shown that high levels of vitamin C help clear congestion. Add chili peppers, ginger, garlic, and/or horseradish to your daily recipes. These foods contain agents that break up mucus and relieve congestion. Eat pineapple. It contains bromelain, which helps reduce inflammation in the nasal passages. Increase your omega-3 essential fatty acids by selecting high-quality wild-caught salmon, miminal-mercury albacore tuna, fish oil, avocados, and sprouted walnuts. Eat raw, organic vegetables after washing them. Add nutrient-dense, unprocessed foods, such as sprouted nuts and seeds, to your diet. Common allergy-causing foods such as dairy products, eggs, wheat, and corn (including corn derivatives such as dextrose, maltodextrin, corn syrup, fructose, modified starch, corn starch, margarine, shortening, and corn oil) Chronic sinusitis can be caused by an underlying food allergy or intolerance. All foods containing refined sugar or artificial sugar-substitutes such as aspartame. Limited caffeine intake ,While moderate amounts of caffeine may be beneficial, excessive consumption of caffeine may aggravate sinusitis.